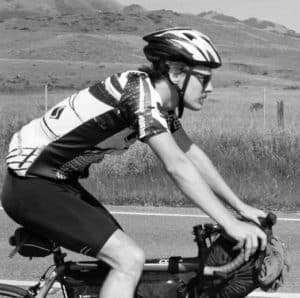 Buying panniers for bike commuting may seem pretty simple – just find a good looking bag that will fit your bike; however, I am actually pretty picky about my panniers. I think it is worth spending the time to look at what’s available before purchasing panniers. Most panniers are not large enough for carrying the amount that I desire. My wife and I were in the market for a new bag for her commuter bike, and wanted to make sure that whatever we purchased had enough room. She’s a teacher and has a fair amount of supplies, books, and stuff that she likes to bring to and from work. Our favorite pannier is the Roswheel Expedition Double Panniers, available on Amazon.com (pictured above). They are extra rigid, made of quality material, and have two huge compartments. They cost a little more, but they are totally worth it in my opinion. That’s our top pick. The material that Roswheel used on this pannier is one of its strengths. It’s made of a top quality retro canvas that has a PU coating that helps with waterproofing. This pannier is built for sturdiness, and can hold quite a bit of stuff. You don’t have to worry if it will rip or tear. Maybe there’s a reason they colored it green like a tank? All this to say, it’s a really awesome bag. 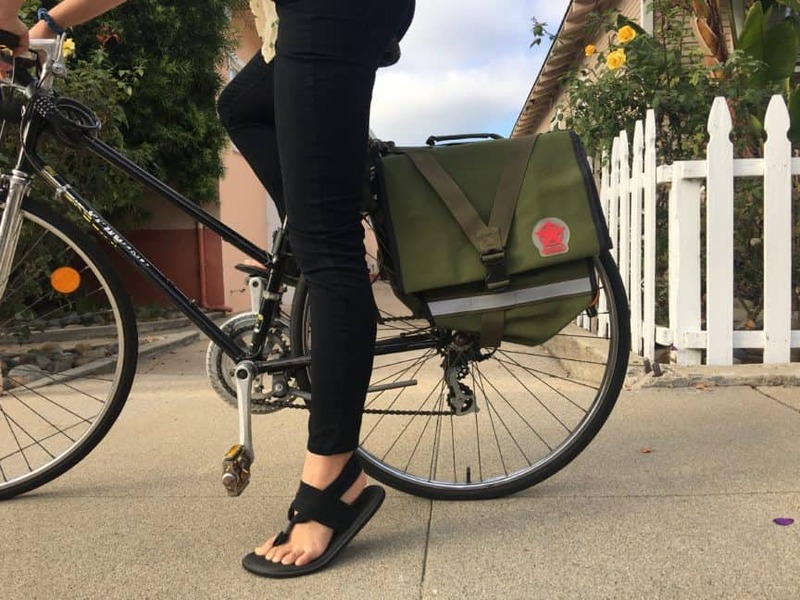 One tip for this pannier – when we first installed it onto our bike we had trouble with it hitting the spokes of the tires while pedaling. After some quick troubleshooting we solved this problem. The bag has thick velcro straps on the side that are to be used to secure the bag. If you pull these straps too tight you will cause the bag to rub against the spokes. The solution is simple – don’t over tighten the velcro straps. My wife has been using this pannier daily with no problems now. Some bike commuters want a pannier that they can quickly remove from their bike. The Roswheel pannier that I talked about above takes about a minute (or two) to unstrap. If you’re looking for a pannier that can go off/on the bike in a matter of moments I would recommend the Topeak pannier/rack system. I say system, because to use this pannier you have to use their specific rack. Topeak has a rack (MTX Bike Rack) that fits their bike pannier bag (at Amazon). With this system, you literally slide your pannier onto the rack and it locks in. No straps, no fiddling necessary, it is on the moment you slide it onto the rack. Once you arrive at your destination you simply slip the back off the rack and it’s ready to go. This pannier was created for the convenience of taking it wherever you need it to go quickly. The only downside I see with this system is that it is an added cost having to purchase the panniers AND their rack. But if you’re looking for a pannier that can be removed in a pinch than this could be the right commuter pannier for you. Ortlieb makes a quality pannier that as one bicyclist puts it “expedition quality.” I read from one bike commuter that he used them on a 300km bike adventure and that they performed wonderfully. Are you planning to commute in ice, hail, rain? This could be the pannier for you as these things are completely waterproof. It’s a simple roll down the top to close type bag. They have lots of space for all the things you’ll need to carry, and are able to mount on a variety of different racks. While I have never used these personally, it seems like this would be the go-to pannier if you’re wanting to be extra careful that everything stays dry while on your commute. The only downside of this guys are the price. They are not cheap. Some people swear by Ortlieb, but I have never given them a shot due to the expense. Check them out on Amazon if you’re interested. Should I use a pannier? We hear this question from time to time, and the answer is yes! There are other options to carry things on your bike such as a backpack or a crate, but we find the pannier to be the best method. Even on a short commute a backpack can cause your back to sweat, and we like to sweat as little as possible on our rides. A good pannier won’t affect bike handling much and will protect your stuff from the weather. The other bonus to a pannier is that you can carry more things than if you were wearing a backpack. Obviously the more you carry in the pannier the harder you’ll need to pedal, but you have the freedom to carry more if you wish. Really the only downside towards using a pannier is the price. Generally speaking, it will cost more for you to rig a bicycle with a rack and pannier than purchasing a cheap backpack. 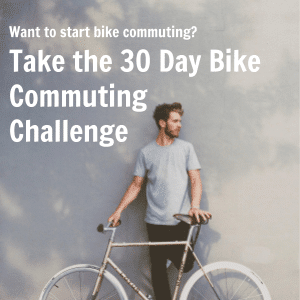 For the routine bike commuter, I think it’s worth the cost. There are a lot of good options out there for bike commuting panniers. It can be tempting to just go purchase the most fashionable panniers and hope they work out. If you are a regular bike commuter you will want to get the panniers that functionally work for you before style. For me, I’ll stick with the Roswheel Panniers as I think they are the best panniers for bike commuting. 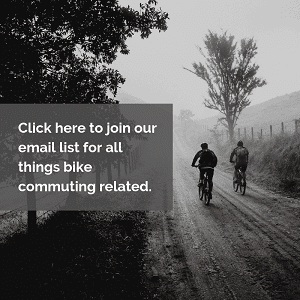 If you’re looking for good quality bike commuting gear, I have other pages like this one recommending my favorite helmet, bikes, lights, and other bike commuting gear and accessories on the recommended gear page of this site. It’s all bike-commute tested gear that I love.